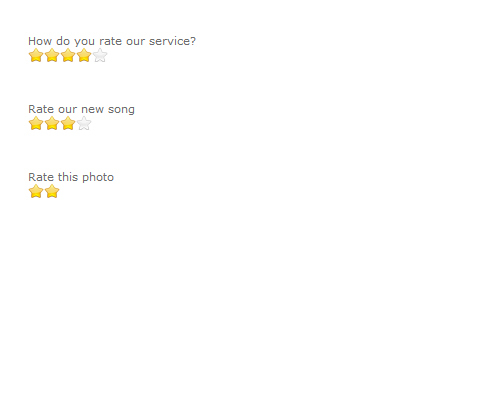 StarsRate is a "rate my pic" type of script used to poll your web site visitors. If you've always wondered what other people think about your images, articles, posts,.... it is now easy to find out. When creating a polling item you can choose how many stars it will have, titles for each star, if and how voting results will be displayed. Unlimited domain usage & free installation support! - Custom modifications - we do ALL kind of modifications to the script. Let us know what you need and you will have it ! Qweas is providing links to Stars Rate 3.0 as a courtesy, and makes no representations regarding Stars Rate or any other applications or any information related thereto. Any questions, complaints or claims regarding this application Stars Rate 3.0 must be directed to the appropriate software vendor. You may click the publisher link of Stars Rate on the top of this page to get more details about the vendor.